Remote Antennas | Stadiums | Buildings | Tunnels | LF Engineering Co.
LF Engineering's line of specialized active antennas (VLF through HF) are compact, waterproof, very rugged, and highly sensitive for their size (26" x 1"). Products include the L-400B, L-111, M-601C and H-800. Used in commercial and private installations around the world, LF Engineering active radio antennas are proven performers in the most extreme environments, year after year. The light weight antennas are easy to install onto masts, towers and vent pipes with cabling run options of over 600 feet (180 m) between an installed antenna and the receiver. The heart of the antenna is a proprietary FET preamplifier with EMI protection and filtering all sealed within protective PVC. Power is supplied to the antenna preamplifier by way of the coaxial feeder cable. 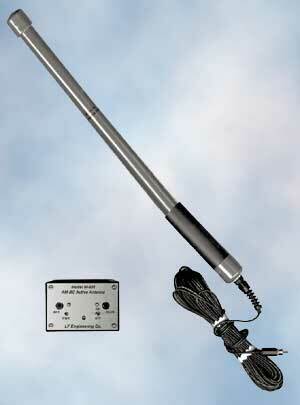 The actual internal wire whip antenna is less than 20 inches in length. LF Engineering active antennas are designed primarilay for limited space applications, noisy environments and for the cabling of radio signals into RF shielded environments such as stadiums, buildings and tunnels. The M-601C AM broadcast antenna, designed for MF reception (550 to 1750 kHz), is the only outdoor source antenna of its type to be solely specified as a unique standard for all new and renovated sports stadiums and arena projects throughout North America. Contact LF Engineering for more information on commercial applications.